Have you ever wanted to go for a day hike but not known what gear to take with you or how to go about planning a trip with your friends and family? 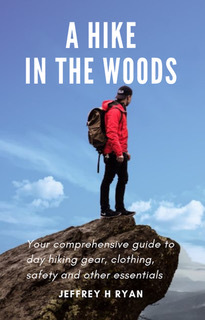 EPTR contributor and Maine adventurer Jeffrey Ryan has just published A Hike in the Woods, which distills his decades of knowledge and field experience into one handy tome (or download). Ryan is the author of Appalachian Odyssey: A 28 Year Hike on America’s Trail and has hiked thousands of miles throughout North America and shares his tips for everything from choosing hiking boots and clothing to keeping insects at bay. You’ll also find advice on navigation and first aid, resources for finding trails worldwide and a day hiking checklist of essentials to take on your adventures. Here’s a taste of his text followed by details on how to order it. Hiking boots are the most important piece of equipment you have on the trail. To state the obvious, taking care of your feet is essential. So is staying upright. The consequences of choosing footwear poorly compromise your ability to do both. Some folks will swear that hiking uphill is the hardest part of the sport. I’ve always contended they have it backward. When you’re climbing, you can employ a lot of muscles—glutes, calves, quads, and in some cases, arms. But when you’re descending, all that pack weight seems to rely on one thing—your knees. Using poles lets you take a lot of that strain off of them. Poles also help you stay upright on tricky stretches of down-climbs, like picking your way down a steep rock face when there’s not much for your boots to grab. But there’s more. Poles give you four points of contact on stream crossings. Whether you’re walking across a log, trying to rock-hop your way to the other side or wading across a knee-deep stretch of river, poles can keep you from taking a bath. The age-old trade-off in pack design is weight vs. function. It makes sense. You don’t want to be carrying a pack that weighs a ton before you even put anything in it. On the other hand, a sack with unpadded shoulder straps doesn’t weigh much but makes your shoulders ache. The key is finding a pack that lives in the sweet spot.